If you make a lot of music on the go, the Blackbox M10s will give you some sonic privacy. Noise cancelling works well. Decent audio performance. Comfortable. Can be used without power. Relatively affordable. They leak a bit of sound. Although conventional wisdom has it that mixing on headphones is A Bad Idea - because sound is piped directly into each ear, you don't get the left/right bleed that comes from using monitors - the popularity of laptops, iPhones, iPads and other mobile devices means that most of us now do at least some of our music making on the move. 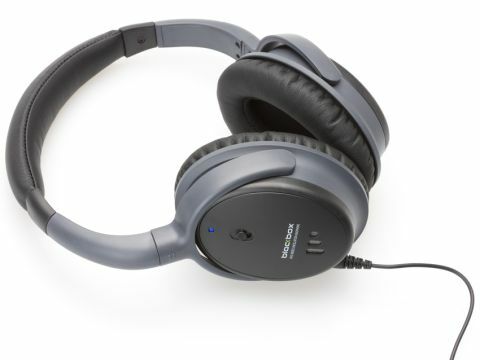 This being the case, a decent, comfortable set of headphones is becoming a must for the hi-tech musician, and the Blackbox M10s have the added advantage of offering noise cancelling technology. This comes from Phitek Systems, a company that has been licensing said technology to other manufacturers for a while, but is now producing its own cans under the aforementioned Blackbox brand. In the box you get the headphones themselves, two detachable stereo 3.5mm jack cables (so if one breaks, you've got a spare), a dual 3.5mm mono airline adaptor (noise cancelling 'phones are a godsend on planes), a 6.5mm stereo adaptor, a silky carry pouch that feels like something a magician should have, and a AAA battery. The battery is required for the noise cancelling to work, though usefully, the M10s will also function (albeit with compromised performance) without power. That said, 50 hours of use are promised from one AAA, so if you carry a spare you're unlikely to ever have to listen in this mode. Once you've got them on, the M10s don't throw up any unpleasant surprises. Bass is tight and well-defined and mids are punchy. There's not the top-end sparkle you get from some headphones - and overall, performance is polite rather than bruising - but these cans punch their weight sonically. That said, the M10s wouldn't be anything remarkable if they didn't cancel noise, so it's fortunate that they do this pretty well. Flick the switch and the majority of background buzz and hum is eliminated, and once you've got your music on, you can't hear much else either. The only downside is that leakage is slightly higher than you might expect; you won't be able to hear the guy next to you chatting on his mobile phone, but he may be checking out your latest dubstep production whether he wants to or not. Ulimately, though, the M10s come recommended, having much more in common with more expensive noise cancelling headphones than cheaper ones. They're comfortable to wear for long periods at a time - great news if you're going to use them for music making - and do a fine job of shutting out the world around you.